As far as fashion is concerned, Nashville is surely on a come up, especially this spring. As you know the big fashion event the Nicole Miller Fashion Presentation, sponsored by the Cystic Fibrosis Foundation (CFF), is certainly going to be a big hit with Nashville’s fashion folks. 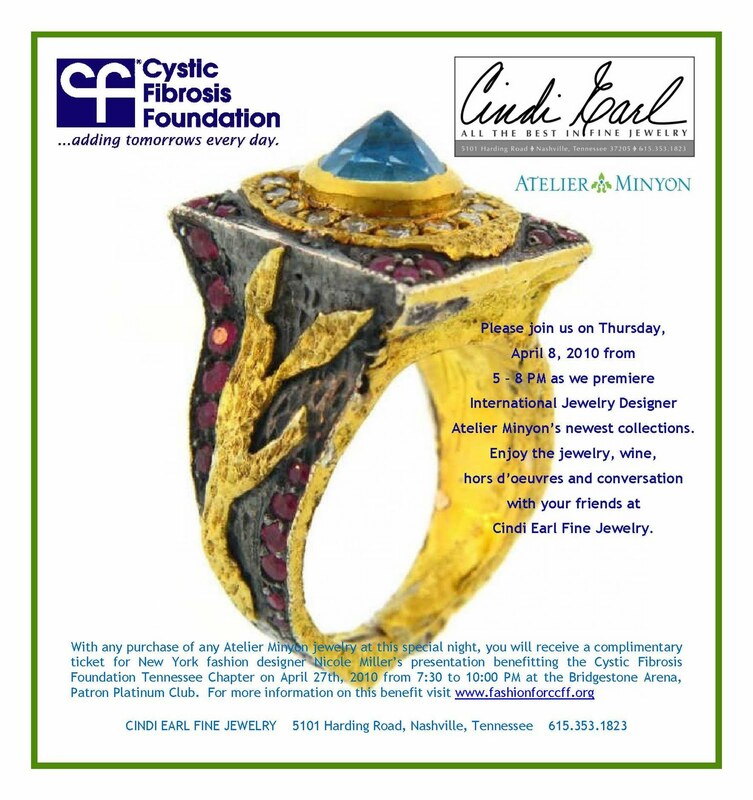 To start the month off, the CFF will be joining Cindi Earle Fine Jewelry to debut Atelier Minyon’s new jewelry collection. Atelier Minyon is a Turkish jewelry company with an international following. The company has recently opened a flagship store in NYC. Now, the handmade jewelry, reminiscent of old-world Turkey will be offered in Nashville. Cindi Earle Fine Jewelry (5101 Harding Pike, Nashville, TN) will host the debut of newest collection by Atelier Minyon. There will be drinks, hors d’oeuvres, and shopping! When you buy a piece from the new collection, you will get a complimentary ticket to the Nicole Miller Fashion Presentation. What a great way to help the Cystic Fibrosis Foundation.